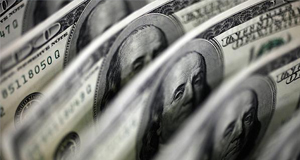 FOREX: The dollar index is fractionally lower on Wednesday (-0.06%), after finishing the previous session down as well, weighed on by a slight pullback in US bond yields. The British pound outperformed, as fresh media reports amplified optimism that a Brexit deal may be reached by next week. On the other hand, the euro surrendered ground across the board, even despite some soothing remarks by the Italian PM. STOCKS: Wall Street closed mostly in the red on Tuesday, albeit only modestly, as concerns around elevated bond yields and a worsening outlook for global growth following the latest IMF downgrades kept risk appetite in check. The Dow Jones (-0.21%) underperformed, while the benchmark S&P 500 (-0.14%) wasn’t far behind. The tech-heavy Nasdaq Composite though, inched higher by a marginal 0.03%. Sentiment was a little better in Asia on Wednesday. In Japan, both the Nikkei 225 and the Topix climbed by 0.16%, while in Hong Kong, the Hang Seng gained 0.39%. In Europe, risk appetite remained sour, as futures tracking all the major indices are flashing red, pointing to a lower open today. COMMODITIES: Oil rose on Tuesday, on the back of news that Hurricane Michael turned towards Florida, leading to the shutdown of nearly 40% of crude production in the US Gulf of Mexico. On the other hand, the outlook for demand darkened as the IMF cut its forecasts for global growth, thereby keeping a lid on gains in the precious liquid. Prices pulled back somewhat on Wednesday, with WTI dipping by 0.21% to $74.78 per barrel, and Brent inching down by 0.18% at $84.85/barrel. In precious metals, gold is nearly flat today (+0.04%) at $1,188 per ounce, trading close to the lower bound of the range it has been contained in recently. The British pound ended up being the best performer in Tuesday’s session, gaining ground against all its major peers as a fresh round of Brexit headlines painted a brighter picture around the prospect of a near-term deal. Media reports suggested the EU and UK are making material progress in the Brexit talks, and that the divorce terms may be agreed by Monday, ahead of the all-important EU summit next week. Although unconfirmed, investors seem to have taken the news at face value, immediately pricing out some of the risk-premium on the pound. While it’s not out of the question that an accord could be reached by Monday, one would be forgiven to take this with a grain of salt. The absence of detail in these reports suggests some caution is warranted, as this may simply be another dose of optimism at this point. That said, it is becoming increasingly clearer that momentum is shifting in favor of a deal. The real question may be whether one will be delivered by next week, hence catapulting sterling higher, or whether the proverbial can will be kicked down the road for the umpteenth time, leading investors to rein in their optimism and thereby weighing on the pound. In the rest of the G10 FX space, the safe-haven yen was the second-best performer, as markets remained largely in risk-off mode amid concerns around a potential tariff-driven slowdown in China, jitters around elevated bond yields, as well as the unresolved situation in Italy. On the latter subject, Italy’s PM Conte said yesterday markets will calm down when investors have read the details of the highly-disputed budget. That helped bring some relief to the battered euro, though the single currency still underperformed, finishing the day lower across the board. The dollar meanwhile, gave back early gains to close slightly lower against a basket of six major currencies, mimicking similar moves in the yields of longer-dated US Treasuries. Once again, the US President voiced his displeasure with the Fed’s pace of raising rates. He said the Fed doesn’t have to hike as fast when there are no signs of inflation in the economy, though he also noted he doesn’t want to interfere in monetary policy decisions. There wasn’t much market reaction, as investors have likely become accustomed to such remarks by now. Wednesday’s calendar features monthly GDP figures out of the UK, as well as numbers on industrial and manufacturing output out of the nation. In the US, data on factory inflation will be attracting interest. At 0830 GMT, UK GDP numbers for August will be made public. The pace of growth is anticipated to ease to 0.1% m/m from 0.3% in July. Despite the monthly deceleration, this would still leave the annual rate of expansion at 1.6%, thus not raising any major red flags on economic activity. On a three-month rolling basis, growth is forecast at 0.6%, which would match July’s rate. Also of importance and due at the same time will be figures on industrial and manufacturing output. Manufacturing production is projected to re-enter a path of positive growth on a monthly basis during August, after contracting by 0.2% in July. Furthermore, the UK’s goods trade balance for August is slated for release at 0830 GMT as well. The relevant deficit is expected to stand at 10.90 billion pounds, widening by roughly one billion compared to July. However, as has been the case in the past, any Brexit developments are likely to steal the thunder from UK economic data, hence driving sterling pairs. In this respect, a report yesterday made reference to a UK-EU deal on the former’s exit from the bloc being reached by Monday. The prints on September’s US factory inflation as gauged by the producer price index (PPI) will be hitting the markets at 1230 GMT. 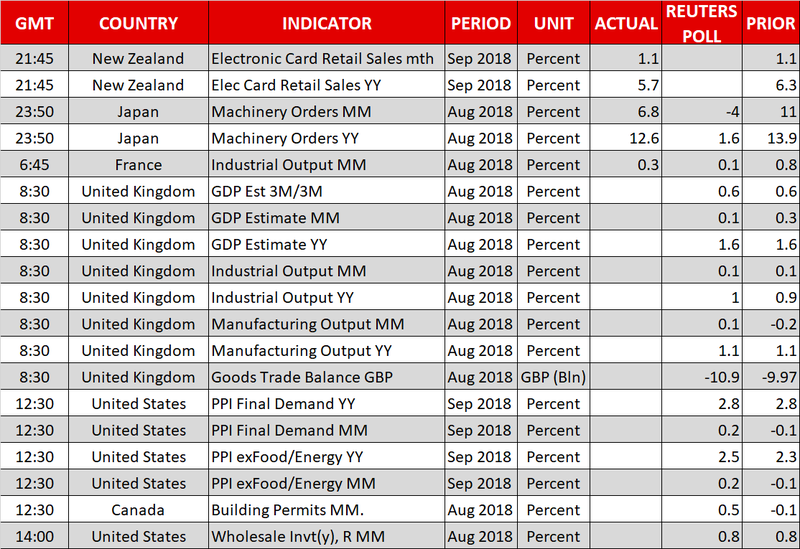 On a yearly basis, headline PPI is predicted to grow by 2.8%, the same as in August, while the core measure that excludes volatile food and energy items is expected to expand by 2.5%, faster than August’s 2.3%. Traders may use these figures to speculate on how tomorrow’s CPI numbers will turn out. It should be kept in mind though that the two gauges (PPI & CPI) are far from perfectly correlated. Lastly out of the US, August wholesale inventory data will be released at 1400 GMT. Canadian building permits for August are due at 1230 GMT. Elsewhere, investor angst over Italy’s budget plans as well as over Sino-US trade tensions remains in the background. The ECB’s Mersch will be participating in a discussion at 0800 GMT, while Bank of England policymaker Haldane will be giving a speech at 0910 GMT. Fed policymakers Evans (non-voting FOMC member in 2018 – 1415 GMT) and Bostic (voter – 2100 GMT) are also on the agenda. In energy markets, weekly API data on US crude stocks are due at 2030 GMT. 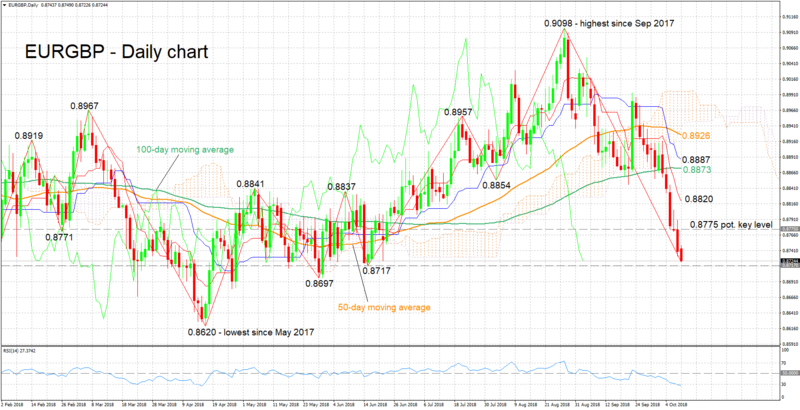 EURGBP touched a four-month low of 0.8723 earlier on Wednesday, after finishing lower in the previous five days. The short-term bias is clearly bearish, something which is also supported by the negatively-aligned Tenkan- and Kijun-sen lines, as well as the declining RSI. Notice though that the RSI has entered oversold territory below 30, a sign that the selloff may be overstretched. Upbeat UK data or a Brexit deal are likely to push the pair further down. Immediate support could occur around 0.8717, this being a previous low with the area around it encapsulating another bottom from late May at 0.8697. Lower still, the pair’s lowest since May 2017 of 0.8620 would be eyed. Conversely, disappointing figures or a Brexit deal not receiving traction are expected to boost the pair. The zone around 0.8775 was congested in the past and may act as resistance to gains. Stronger advances would turn the attention to the region around the Tenkan-sen at 0.8820, which captures a couple of tops from previous months as well. Further above, the current level of the 100-day moving average line at 0.8873 would come into scope. Italian developments can also move the pair.